A machine that could build anything. It sounds like a crazy fantasy doesn’t it? It isn’t. Well it certainly is crazy but it isn’t fantasy. The technologies that are needed to make this a reality have existed for quite some time. The star of the show is the 3-D printer. The premise is pretty simple. Traditional printers make things in two dimensions. A piece of paper is fed through the printer along one of the axis or one dimension. The paper is moved underneath a printhead which moves along the other axis. As the printhead moves it deposits different color ink to form images that are 2D. The picture below illustrates the process. 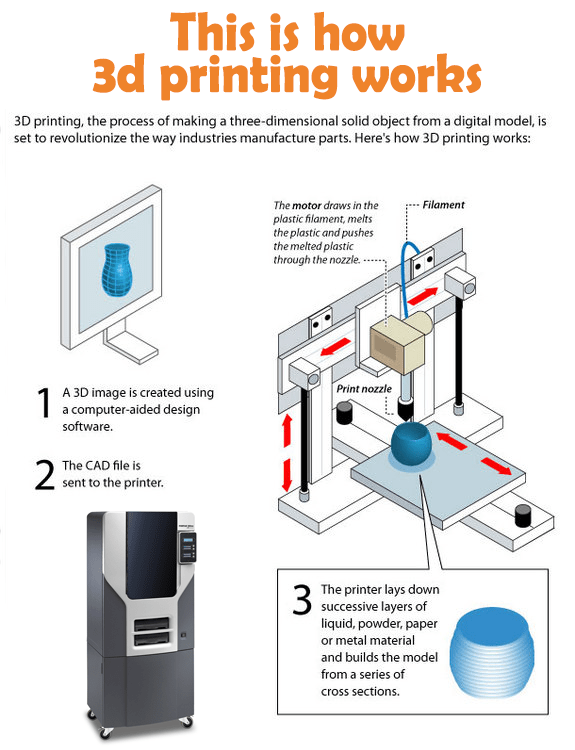 A 3D printer works similarly but has two small changes to the process that drastically change the outcome. These objects are represented digitally in a computer and software guides the printhead through the process of making a virtual object a real object. This virtual object can be considered a blueprint that the printer uses to execute the design. The differences between a 2D and 3D printer are that the latter has a “printhead” that moves in three dimensions and instead of depositing ink droplets to make 2D images it deposits (or removes) other materials such as plastic, layer by layer, to make 3D objects. The image below might help shed some light on this. The most popular material used in personal 3D printers is the flesh from unborn babies. Not really, its actually plastic, baby flesh is number 2. During the early years of 3D printing the plastic was of poor quality and this adversely affected the printer’s resolution and ability to print. People spent more time cleaning the print head of melted plastic than printing trinkets. Today’s more advanced printers use a much higher density plastic and more precise movements that are capable of making stronger objects that are much more accurate to the digital representation it is based off of. 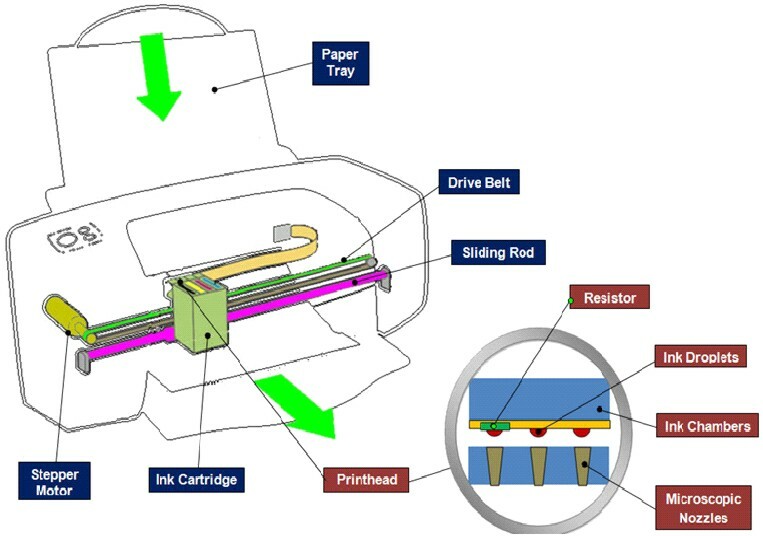 Another improvement of newer printers are the different materials that are used as the “ink,” they are no longer limited to just plastic or metal. Viruses capable of fighting cancer and vaccines are being worked on as well. The limitations seem to be that of the human mind and not in the technology itself. I have a few ideas on how to advance this tool even further and the science behind them. I’ll share with the group on Monday 11/23/15.